Ideal for work shops and industrial areas. 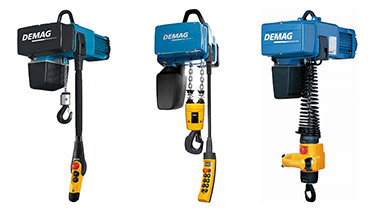 We stock and quick ship most 1 ton and 2 ton electric chain hoists including manual/hand operated hoists. 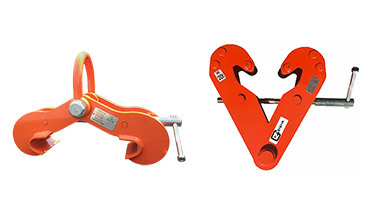 Ergonomic Partners offers the industries' top names such as CM, Coffing, Budgit, and Harrington to solve your pneumatic, electric chain hoist and overhead crane needs. 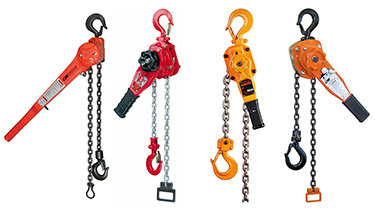 We offer a full range of hoist products including 1 to 5 ton electric chain hoists as well as wire rope, air chain, trolleys, lever, chain falls, and beam clamps. 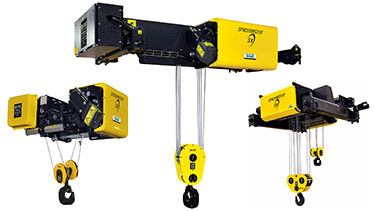 Why Buy an Electric or Pneumatic Chain Hoist? Electricity and or compressed air are readily available in most plants. 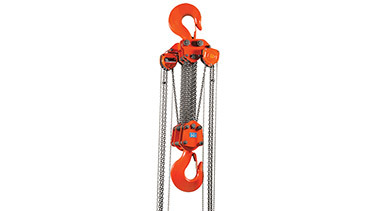 They are typically more compact than a wire rope unit. 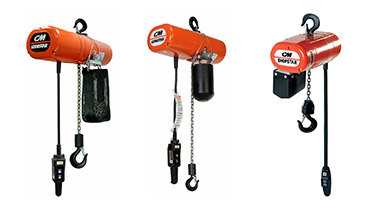 Most of our chain hoists for sale have an overload slip clutch to prevent over capacity loads. Especially in the lower capacities, high speeds are available to help increase work force productivity, better ergonomics and safety. 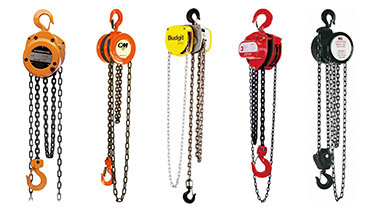 Chain typically is a more durable and less expensive option when compared to wire rope. 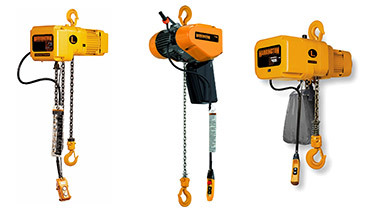 Most electric hoists are H-4 duty cycle and air powered are h-5 duty cycles. By making a simple chain change-out the lift can be increased or decreased. Hook mounting allows units to be easily changed out around the plant. An air powered motor is inherently spark resistant. Add specific features such as stainless chain, and bronze hooks to meet a specific environment. For optimum pneumatic or electric chain hoist life consider that the ball bearing life varies inversely according to the cube of the load. 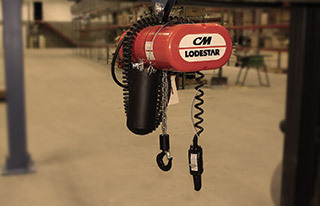 An example is a one ton electric hoist operated at a mean effective load of 1/2 ton will have a ball bearing life 8 times that of a hoist used at its maximum capacity. Obviously this is a major consideration if hoist repair cost and downtime are issues. 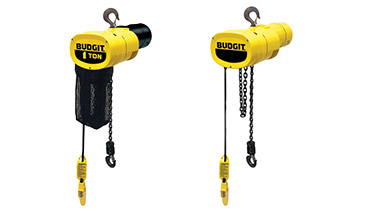 Manually operated hoists, chain falls, hand chain hoists, lever hoists provides industry with an inexpensive way to handle your product safely. 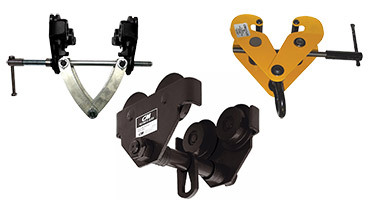 We can help out the smallest machine shop, and garage or the largest mechanical contractor to fulfill your order quickly from our stock of hand chain hoists, trolleys and electric hoists. 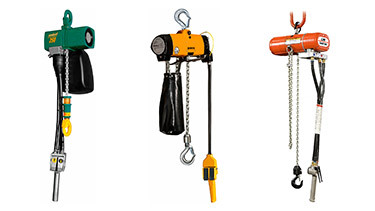 Ergonomic Partners provides manual/hand, air and electric hoists; serving clients from coast to coast, Canada, Mexico and especially focused in the states of Missouri, Illinois, Indiana, Kansas, Arkansas, Mississippi, Nebraska, Tennessee, Kentucky, Iowa, and Oklahoma. 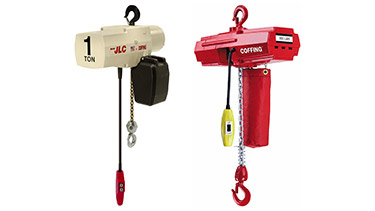 We specialize in shipping 1 Ton and 2 Ton Hoists fast.